The den at 'Killenworth', the George D. Pratt estate designed by Trowbridge & Ackerman c. 1913 in Glen Cove. Click HERE for more on 'Killenworth'. 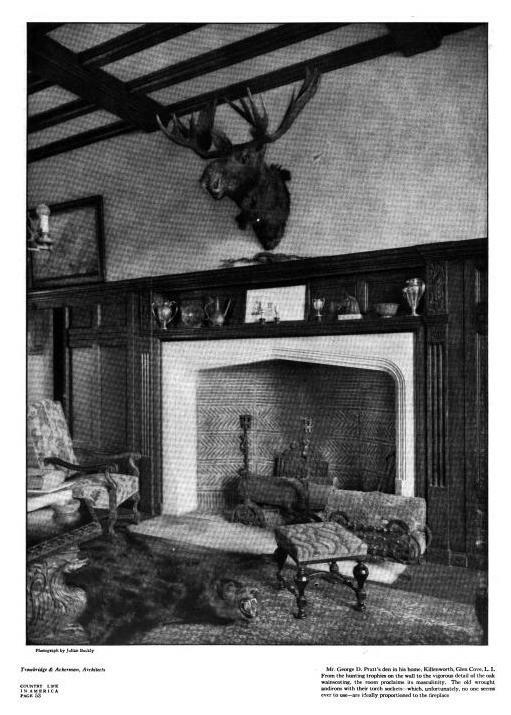 Photo from Country Life, 1916. The old wrought andirons with their torch sockets -- which, unfortunately, no seems ever to use -- are ideally proportioned to the fireplace. Has anyone ever seen "torch sockets" in use? What a great pile! And I really appreciate the pointing out of the convertible torches, Ancient! My enthusiasm for moose heads and bear skin rugs has waned, however, I would have loved it all as a kid. Ancient- I have friends who have a grand, old house Palm Beach and actually do have candles in the torch sockets. Alas, they never use the fireplace for an actual fire- which I, at least, sadly lament on a cold, rainy Florida winter evening. As to Killenworth: If I remember correctly,a few months ago Zach posted a photo of a surprisingly light and airy Georgian style sitting or drawing room at killenworth. It was a pleasant surprise. This interior is far more what I expected in the house- a bit heavy and ponderous. I am always surprised, but have never asked about the vauted swimming pool at Killenworth which certainly has to be one of the earliest examples of a swimming pool being made an integral part of the architecture of the house- at least on the Eastern seaboard. It seems from photographs that the sides of the pool were thickly planted up to the coping, which certainly doesn't make for ease or convenience of use. Does anyone know if this was the case or if it is more of an "optical illusion" caused by the angle of the photographs that are most often shown of the pool. And do the Russians stll cool their little selves in its waters, or has it been filled in? If you scroll down a few pages at the below link you'll find the Georgian Morning Room at Killenworth. In case you didn't catch this - check the February 2010 "Goodwin Place" post. Someone has added new comments. does anyone know when the next charity function will be held at Killenworth? I believe that the city of Glen Cove sometimes arranges tours of the home. I tried calling the Russian Embassy in NYC and got nowhere.